Mum wishes she had me as a kitten, but that didn't happen. She got me when I was about one and one half years old. Mum also thinks that I still have a lot of kitten left inside of me. Here is a peak at the new blankie mum is working on, lots of bright colors. She tries to do a bit every day. Just like she tries to read a bit of her book every day. Some days more than others depending on what she has to do that day. Almost all of our snow melted, at least those places where it wasn't piled up from mum shoveling. Then, on Sunday afternoon it snowed a little bit again. Hardly enough to even cover the grass. But it got gold, so it might be around for a bit. So that is about it from here. Last few days of January, then on to my Gotcha month of February. Also we can cellybrate Groundhog day, Valentine's Day, mum's purrthday, president day. That is all I can think of for now. HiYa, Ducky here. Happy Caturday. Me and mum are up and moving around for the day. It is warmish and sunny. Mum says maybe a bit of open windows today! Yipee! 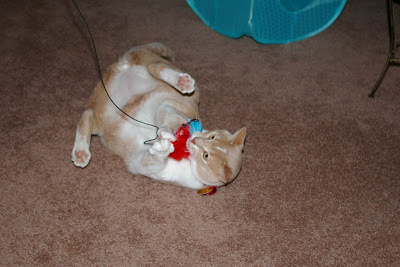 You can see me playing with my nip toy with just a bit of sun coming in the windows to brighten things up. This may mean major time later in the windows. Mum discovered a wonky way to make a sammich without using bread. You take a cucumber and cut it in half. Strip some of the outside green stuff off too. Then scoop out the seeds. Fill with your favorite meat, cheeses or whatever. Mum said this was a bit big to get her mouth around, so the second time she filled each side with stuff, then ate it. Said it was refreshing and delish. Mum says this is grate if you want less carbs from bread. So what are me and mum up to for the rest of the day. She says she needs to clean a bit. She did some of that yesterday. The sucking monster made an appearance. Today her litter box room. Also watching fevvers, reading and crow-shay. Hope you all have marvy weekends! Enjoy. Made it to Thursday, has been a quiet week for far. Mum's only thing this week was to get her head fur trimmed. A few other simple errands too. Mum got her letter from the garden people, she passed her test! Yipee. She didn't get them all correct, but those funky questions that I shared with you before, those she got right. So now mum only has to put in her volunteer hours which won't be an issue. We got rain and snow, but the warms are coming back so the snow will be gone again by the weekend. The blankie I am sitting on is done and mum gave it to Miss Lynn. Now she is working on a really colorful one. No pics of that one. Today's flashback is Derby sitting in a box. I am not that much of a box cat, strange but true. Mum's orinch balls from Florida came in a different kind of box. Enjoy. Thinking inside the box can bring inner peace and a good place to nap. This picture is from last year when mum's shipment of orinch balls comes from Florida. Mum calls them sunshine you can eat. I like the box in the sun to nap in. It is a win-win situation. Mum gets her orinch ball to eat, I get a box! We ManCats have a new place to hang out. The M-Cats Club. A nice place for us ManCats and ManCats in training to let our furs down and chill. No worries about impressing the ladycats, just a chance for us to be us. Drop by and check it out, it's a real cool place! It is supposed to finally get warmer here this weekend. It has been way too cold, so cold that mum keeps the blinds down to keep the warmth in the house. But I can still get at sunny windows to get my sun spots. And behind them to see the birdies in the back yard. To brighten up the landscape, which is mainly white a picture of flowers from last summer. Virginger and Phat Flower Eric (PFE) with the pretty impatient flowers. I can't wait until spring gets here, when we have flowers again and open windows. WooHoo, the weekend is here. Have fun everyone. HAHAHAHAHAHA! You Betcha we got a pact with the devil. How else can we look so innocent, but create so much mischief! Mum made it home on time and you can see that I am sitting on her to keep her in place. I needed to catch up on my proper doses of loves and scritches. Plus I spent a long time sleeping with her as well. She loves her warm, furry heater. So I was on her lap later and she just couldn't resist and got a moovie of me getting some loves! 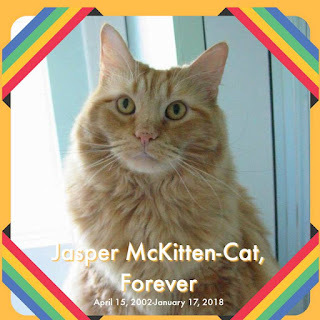 Plus I forgot to post this on Caturday to say farewell to Jasper, another one of us fabulous gingers. Have fun at The Bridge with the rest of the gang. The Stouper Bowl teams are set. The Guys called Pat and the Eagle birds. Mum and me wanted the Jaguars, but while they were ahead early in the game they couldn't hold on. We were super happy that the ViQueens got their backsides handed to them. Plus the streak continues that no home team has ever played in their home stadium. Plus today is Answer Your Cat's Question Day. Ducky: Why don't we have much snow this winter? Mum: Well, some winters are like that. Lots of snow some years, not so much others. Less snow means safer driving for humans which is good. Ducky: Can you order me some sunpuddles? Mum: I can order them, but I can't ensure they will arrive. I can't control the weather! Ducky: Why do you go away so often? Mum: I don't go away that often. A day or two here and there. Mostly to play with racy cars or to go with Miss Lynn to the mayo place. I may be taking a longer trip though later this year. So be prepared! HiYa Ducky here. Happy Caturday. We have had a few warmer and sunny days. Lots of melting going on, so our snow is disappearing again. Plus it is super quiet around here, mum is off gallivanting around somewhere. She said she would be home today. Good, then I can sit on her and make her stay home for a while. Oh well, see you all Monday. Ha, Derby is showing off his bottom below. I am more shy, I only show my bottom to mum when I want belleh rubs! We had snow, it all melted, now we have snow and it is supposed to all melt again. It is furry windy out and mum caught the snow blowing off the naybor's house. That is what mum calls a cold video, makes you cold just to watch it. Me, I just stay all cuddled up with mum and soak up her warms! Ensure that you get in touch with your inner kitten. Playfulness is good to keep you young. I love playing at any time of the day or night. Lately I have been playing with mum's light that she has on a table in the sleeping room. I like to push it over and chew on the shade. I have been starting my play at very dark o'clock in the morning. Mum is not happy as I wake her up. She says she needs her beauty sleep. Yeah, I guess I would agree with that. So mum is telling me that if I continue to do this, I will get excluded from her sleeping room. It is going to get furry cold and I like to snuggle and sleep with her when it gets cold. I guess I better behave! Today is the day we honor the guy whose quote is above. So we need to spread love all over the place so we have more furiends. 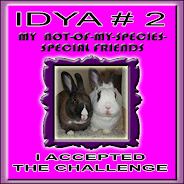 That is true of the cat blogosphere, we have so much love and furiends all over the place. Winter is coming back, not as cold and some snow is to come. Mum doesn't have anywhere to go, so we can sit and watch the snow come down. Started to snow late on Sunday night. We did lots of fevver watching this weekend. We were seeing lots of birds and some birds we don't see often and we were seeing lots of them. Above is a red poll and below a siskin. You can see them in big groups on the ground. With no snow it was hard to pick them out and figure out just exactly who they were. Mum watched a tiny bit of the feetsball. She was bummed that the ViQueens won at the last second of the game. Me, I was just hanging out with mum as she readed her book or worked on the puter. I get lots of loves and especially tummeh rubs. I loves tummeh rubs! HiYa, Ducky here. Happy Caturday. Hope all is well. We have a bright and sunny day with no snow on the ground. It is cold, but mum says if we had snow on the ground it would feel worse. But then I don't have to go outside and mum hasn't been outside yet either. Mum slept in a bit, I had to pounce on her a few times to get her out of the sleepy spot. Heck I even through in a few love bites to her arm. That always gets her going as she feels I might attack her head and face! No, I don't think I would do that. I got a nice warm and sunny spot to hang out on for now. Mum's lap and sunshine coming through the windows. 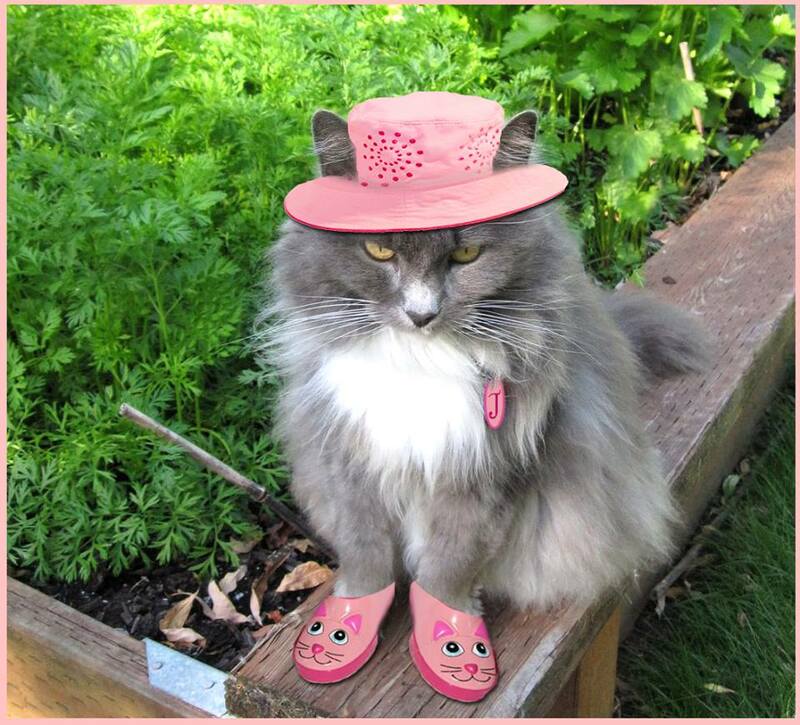 First it is Thursday and during the nice time of the year the girls do the garden report. 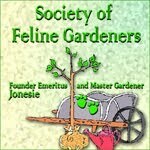 We found out yesterday that the founder of the Society of Feline Gardeners, Jonesie went to The Bridge. So Garden Thursday will be continued in her honor. Little Jonesie all dressed up and ready to garden! Our weather is strange, we were in the deep freeze last week, this week it is super nice. Mum said it was very spring like out on Tuesday. Sunny, warm, gentle breezes. Mum said it won't last long, we should be cold by later today. Me and mum will watch from inside and be all snug. 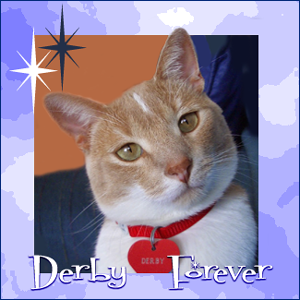 Today we continue with Derby's Throw Back Thursday. Interesting that ten years ago there wasn't much snow. Plus mum had an injured finger! Not allowed, you gotta be able to do treats! Don't be afraid to show your softer side, but remember to rule with an iron paw. I love to cuddle up with Mr T Bear. but can keep mum under my paw as needed. It snowed again on Thursday night into Friday, otherwise most of our snow was gone, all that was left was where it had been piled up from shoveling. Below is a picture mum took on Wednesday afternoon. Mum's finger is OK, but it has to stay under wraps and splinted so she won't bend it. Bending it might make the stitches pop and re-open the cut. She unwraps it to clean it, put medicine on it and then wrap it up again. It is her right index finger and she is right handed. Plus that is her treat feeding hand, so it better heal quick, I need more treats. We have enuf room here to swing me around, although mum would never swing me around. She loves me too much for that. The deep freeze is over! Yipee. Not quite open window time, but wonderful enuf so that there wasn't any icy edge on the fevver baff. It was nice so that mum could actually clean the baff really good for the fevvers. Not warm enuf to not hang out in the ham-mick to be warms with the heaty thing blowing under it. But then I had to go hang out with mum, she has been sleeping poorly at night, but at least yesterday she took a wonderful nap in the afternoon. She ignored the feetsball games for the most part and just took it easy. Me, I came and sat on her so I knew she would stay put and rest. She felt so much better after her nap. So if your humans are feeling icky, get them to take them to take nap. HiYa Ducky here. Happy Caturday. For us the sun has risen and is shining in our front windows. The weather guessers say this will be the last really cold day for a while. I hope so. So me and mun stay warm by staying inside. We watch the outside stuff and marvel how others are out and about on these cold days. Like fevvers and sqwerls. One of the goldy finches coming for a drink. Mum refills the bath daily but with the extreme cold it gets all icy around the rim. Somehow the fevvers don't mind sitting on the cold ice with their feet. We have been seeing Mr Hawk often the past few weeks, coming by looking for something he can eat. Mum says he can have the sqwerls, she counted 7 of them in the yard the other day, all eating around the feeders. Well, except this guy! Plus the fevvers are so brave they are even taking baffs! Mum just shivers seeing them getting all wet when it is so cold out. Of course you want to see me, well here I am in a moovie. This is extreme closeup of me on mum's lap the other day. Can you spy my one dark whisker? Mum says it makes me look even more handsome. That is is for now, stay warm if you are in the cold area. Don't hurt yourself if you have lots of snow to clear. Happy weekend. Yikes, hope all are keeping warms, it is still cold here. Mum does go out for little bits for fresh airs. She needs to feed the fevvers or do a quick brush off of the snow from the drive. Plus we see our buddies in the way south are getting snow and cold. You all be safe now! Now we haven't gotten much snow so far this winter, so if the mousies and voles come out to run around. You can see their tracks in the snow. This was taken last Caturday and mum says it is getting bigger and bigger with more trails. Yep, I see them, and I go crazy jumping from window to window to see them. Today's flashback is Derby showing off his paw. It was cold back then too. Mighty is the paw that rests quietly. Your paws have to rest sometimes. Then when rested you use them to whap things or run around. Having so much fun with everyone coming over to watch the birdies. Since it has been cold here the birdies are around a lot to eat. They gotta eat lots so they can keep warm living outside. Mum came home tonight and the first thing she did, after giving me a few pets, was to go outside in the cold and fill up all of the feeders. I got mum good yesterday morning. She had washed her face, brushed her teeths and refilled my water bowl in the bathroom. She was putting her clown face on and heard me licking, but I was not drinking from my bowl, but from her toothy brush that was wet. She moved it to where I couldn't reach it. HEHE. WooHoo, the weekend is here. Hope everyone has a good one. We are going to watch the snow melt! Mancat Monday - Happy Mew Year. Happy Mew Year! Hope 2018 brings you good stuff in your life and the lives of your humans. We would like the usual stuff of peace and loves. Sitting by mum while she works on the puter. I like sitting here, I push my paws under the puter to where it is all warms. Nice to get the paws toasty! Plus you can see the new blankie mum has been working on. She is making good progress and should be done soon. She did much of this while she was watching the feetsball games today. Mum does not plan to stay up until midnight. I will be on my usual patrol at midnight. Final Feetsball Report for The Pack - they lost, they look bad. They can all go home and think about how bad things were this season and in some cases how back they played. Mum is hoping that a few of the coaches get the boot. Maybe a few people in the front office too. So, Happy 2018, let's make it a good one!